3/4" Inlet / Outlet Two Whole House water filtration system with sediment and CTO carbon block cartridges . Excellent to remove Sediment, Chlorine, Odors and many other chemicals and contaminants. Effectively eliminates many impurities from tap water to offer sparkling clean and great tasting water throughout your whole house. Complete System with Filter Cartridges, Wall Bracket and Housing Wrench. 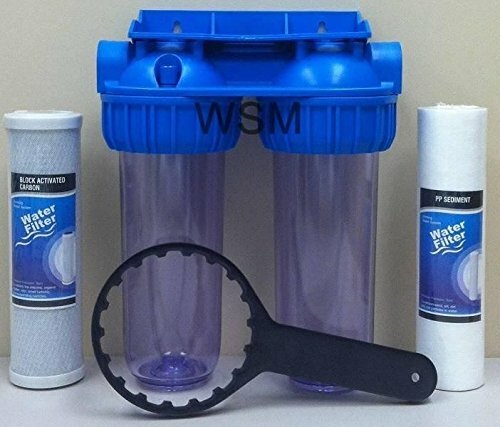 Excellent to remove Sediment, Chlorine, Odors and many other chemicals and contaminants. If you have any questions about this product by BLUONICS, contact us by completing and submitting the form below. If you are looking for a specif part number, please include it with your message.